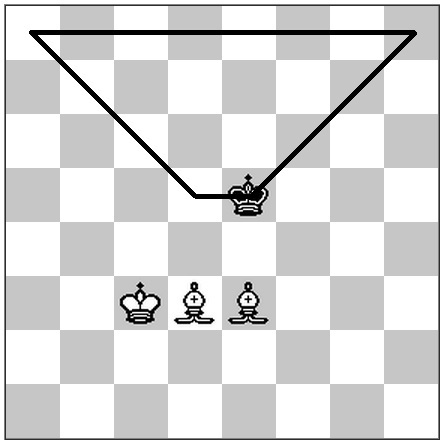 How do you checkmate with the pair of Bishops and King versus King? Are there any stalemates to look out for? What are the key ideas / positions / tricks to make it work? I always like to explain this in a visual way. Basic Idea: Keep the bishops together. 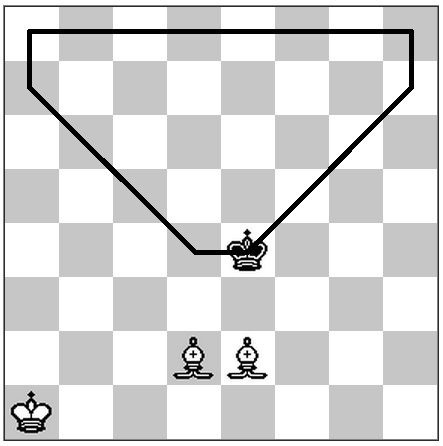 They form a large net (restricted area) from which the opponent king cannot escape. Keeping the bishops together and using the king for support, make the restricted area smaller to push the opponent's king back to an edge rank or file. 11...Kd7 12. Kc5 Ke7 13. Kc6 Kf8 14. Bf6 Ke8 15. 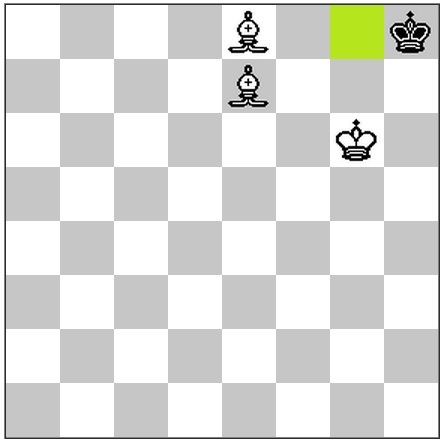 Be6 Kf8 (note: I intentionally chose the 13...Kf8 line because that is more instructive. For the 13...Kd8 line, please see the sample mates provided at the end). In the above position, we shall choose the h8 corner. 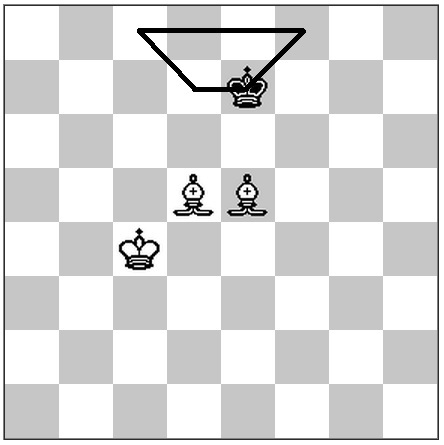 The key is to keep the opponent's king on the back rank while slowly taking away squares from the other side. 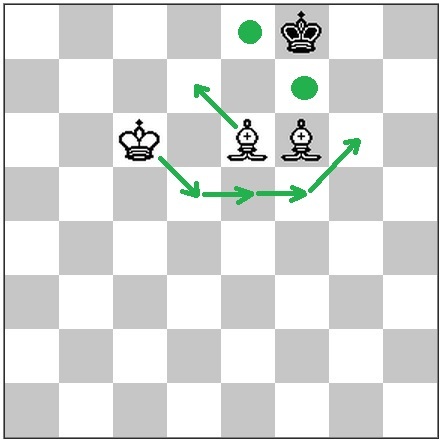 The idea now is to move the king over to the right hand side via Kc6-d5-e5-f5-g6 to cover f7 and then move the bishop to d7 to cover e8, thereby pushing the opponent's king to the corner. Now, we can take control over f8, thereby pushing the opponent's king to the corner. Here, it is important to be careful to avoid a common stalemate that occurs in this position. We observe that White has to make a waiting move in order to challenge the g8 square with check, so that then after Kh8, Bf6+ would be mate. And now the mate is easy. Below, I have included other types of checkmates that can occur if Black play's differently. 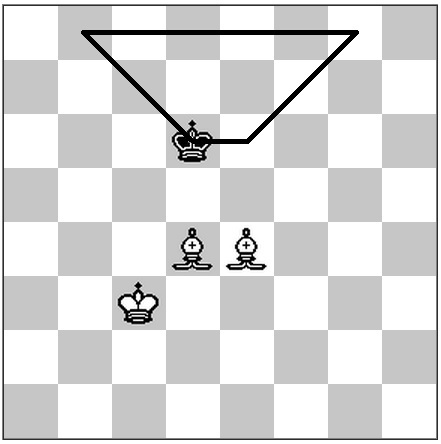 I've also included the fastest mate from the original position which starts with 1.Bc3! 1. Bd2 (1. Bc3 Ke4 2. Kb2 Kd3 3. Bf3 Ke3 4. Bd5 Kd3 5. Be5 Kd2 (5... Ke3) 6. Ka6 12. Bc5 Ka5 13. Kd5 Ka6 14. Kd6 Ka5 15. Kc7 Ka6 16. Bb4 Ka7 17. Bb5 Ka8 18. Ba5 Ka7 19. Bb6+ Ka8 20. Bc6#) 7... Kd6 8. Be4 Ke6 9. Kc4 Kd6 10. Bd5 Ke7 11. Kd8 15. Bf7 Kc8 16. Be7 Kb8 17. Kb6 Kc8 18. Be6+ Kb8 19. Bd6+ Ka8 20. Bd5#) 14. 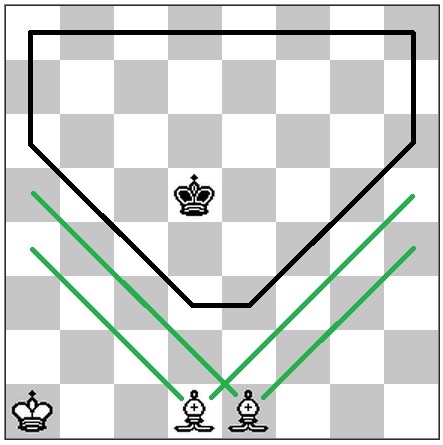 The basic idea is to constrain the enemy king with the bishops working together on a pair of diagonals, just as with a rook you work with ranks and files to push the enemy king to the side of the board. With two bishops you need to drive the king to one of the corners. We'll first start with the ending moves to know where you want to go. Here is a longer example using the bishops to block along diagonals to force the opponent to the side, then the corner. Kf8 12. Be6 Ke8 13. Ke5 Kf8 14. Kf5 Ke8 15. Kg6 Kf8 16. Bd7 Kg8 17. Bc3 Kf8 18. Note that 10. Kd7 would be stalemate. You want to keep your king two squares from the side till near the end. 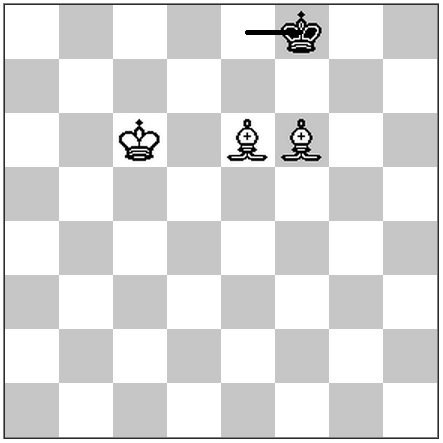 The last few moves, it is good to check the king into the corner mate, so that you don't stalemate by accident. Not the answer you're looking for? Browse other questions tagged endgame checkmate bishops elementary-mates bishop-pair or ask your own question. 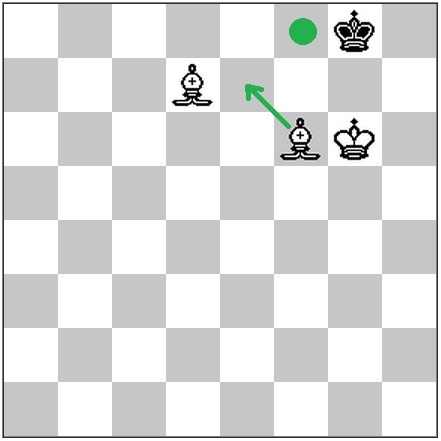 With only a king left, how many moves remaining until a draw? 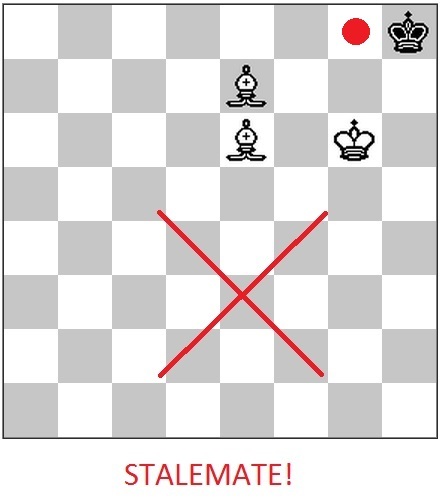 How many steps to mate the only king with all pieces? Are a pair of bishops of the same colour usually worth less than a pair of bishops of different colours?